Margate's failing Dreamland amusement park has been given permission to borrow up to £10m from an offshore hedge-fund, it has emerged. Arrowgrass, registered in the Cayman Islands, initially loaned operator Sands Heritage £600,000 in May 2016. A new agreement between the fund, Sands Heritage and administrators Duff and Phelps has increased that amount. Duff and Phelps said the money would be used to make improvements at the park to get it ready for sale. 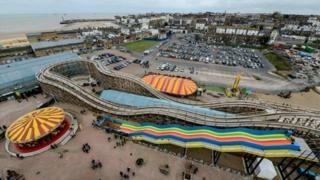 Bernie Morgan, Chair of the Dreamland Trust, described it as a "big milestone in the life of Dreamland". She added: "We know that Dreamland needs a lot more investment. We know the lease protects its life as a heritage amusement park, so I think it's a good thing." However, investment manager Justin Urquhart Stewart of Seven Investment Management said it was "very concerning" to see further investment going into a business "that has always looked very weak". And former Thanet councillor Ian Driver said it was "plain wrong" that Arrowgrass investors might benefit from any profits. The attraction reopened in June 2015 after an £18m restoration but went into administration 11 months later. Duff and Phelps wanted it to continue trading while it attempted to maximise the return for creditors. A statement in August put the amount it owed at just more than £8m. It was initially suggested a not-for-profit operator would plough any returns back into the local economy. Ian Driver, former Thanet councillor, said: "Now that we have got Arrowgrass investing £10m, it is likely that those profits will not find their way back into Thanet but will find themselves in the bank accounts of wealthy people who have invested in Arrowgrass. That is plain wrong." No-one from Arrowgrass was available for comment. Thanet District Council leader Chris Wells said: "I am aware that the administrators are working with investors and creditors to ensure the future of the park is secured."